In talking about his work on “A Brief History of Time” Glass states, “What’s interesting about Hawking is that he’s a wonderful contradiction: The man who can’t move but who goes greatest journey of all.” On the success of his book and the evolution of his own celebrity, Hawking says, “I think ABHOT has been successful for a combination of reasons. One is that people want to the universe around them, and to know where they come from. But another reason is that the public wants heroes. They made Einstein a hero and now they are making me a hero, but with much less justification. But I fit the part of a disabled genius. At least I am clearly disabled.” (For composers this would echo the figure of a deaf Beethoven and his own heroic voyages into the realm of sound). Glass’s predilection for science as a companion to artistic endeavor and perhaps literal musical metaphor continued in pieces his tone poem “The Light” that is based on the 1887 Michelson-Morley experiment into the speed of light. 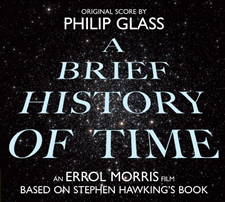 In 2010, Hawking himself spoke at the World Science Festival immediately before the world premiere of Glass’s orchestral collaboration with scientist Brian Greene, “ICARUS: At the Edge of Time” which dealt with the subject of time and black holes.